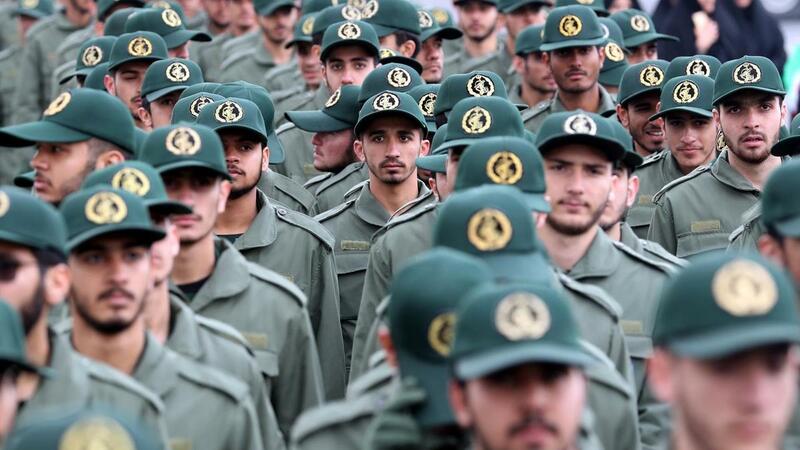 The United States moved this week to designate Iran’s Islamic Revolutionary Guards Corps (IRGC) in its entirety as a terrorist organisation. This is part of what the U.S. calls its “maximum pressure” campaign against the Iranian regime, which has responded with threats to the U.S. and its allies. By January 1979, a year-long revolution in Iran—characterized in practice by increasingly-violent protests and riots—was reaching its climax. The capital, Tehran, was in flames. The revolution’s undisputed leader was Ayatollah Ruhollah Khomeini, based by then in Paris. Islamist clerics loyal to Khomeini and their bazaari (merchant) allies orchestrated the mayhem on the streets, and with the help of the Communists they had organised a series of strikes at the oil fields that paralysed the entire Iranian system. Unwilling to use large-scale lethal force to restore order, the last Shah (King) of Iran, Muhammad Reza Pahlavi, departed into exile, leaving behind an interim government that tried to reach an accommodation with the opposition. Instead, within a month, Khomeini had returned in triumph and the Islamists brought off their long-planned coup d’état. The paramilitary forces at Khomeini’s command that brought him to power in a Bolshevik-style coup became the IRGC, but in truth they had already taken shape, trained by the Palestine Liberation Organization (PLO) in Lebanon and elsewhere over several years in the late 1970s. Lebanese Hizballah is often mistakenly called a “proxy” of Iran’s, when it is actually an organic component of the IRGC. Rather than disband and replace the Imperial Army, Khomeini decapitated it with massive purges and hundreds of executions in a couple of months in the spring of 1979, replacing its leadership with loyalists, while continuing to operate the IRGC as a parallel institution. There were several advantages to this. It meant the nascent Islamic Republic avoided a messy internal confrontation of a kind that happened in Iraq after the U.S. occupation forces dissolved the Iraqi Army, many of whose members joined the insurgency. Khomeini’s regime kept trained military men on its payroll and under its watch. The war with Iraq helped ease tensions: the Army had to take up its primary duty of safeguarding Iran’s territorial integrity, and therefore had little time for domestic politics. The IRGC, on the other hand, had a mandate beyond defending the country; it was charged with defending the revolution, i.e. the theocratic system Khomeini had imposed on Iran, which in practice makes IRGC’s mission as much against Iranians as foreigners. Over time, resources were allocated in such a way as to weaken the Army and build up the IRGC. In addition, the IRGC has control over two specialized entities, the Basij, staffed by religious loyalists and responsible for domestic security, and the Quds Force, led by Qassem Sulaymani, which is responsible for exporting the Islamist revolution. In practice, this means the Quds Force is the element of the Iranian state responsible for plotting terrorism around the world and for interfacing with Iran’s foreign proxies. Sulaymani and the Quds Force component of the IRGC were sanctioned by the U.S. Treasury for terrorist finance of “the Taliban and other terrorist organizations” in 2007. Sulaymani would have two further rounds of personal sanctions imposed on him by the Treasury in 2011, first in May for his assistance to Bashar al-Assad’s regime in Syria as it committed atrocities against peaceful demonstrators, and then again in October for his involvement in the plot to blow up the Saudi ambassador in Washington, D.C., an attack that would have killed numerous American bystanders. On Monday, the U.S. State Department announced that it had designated the entire IRGC as a foreign terrorist organization (FTO), effective 15 April. The designation “highlights that Iran is an outlaw regime that uses terrorism as a key tool of statecraft,” State said, and this has been true “since its inception 40 years ago”. State added: “This action is a significant step forward in our maximum pressure campaign against the Iranian regime”. Secretary of State Mike Pompeo noted in his remarks after the announcement that IRGC is not only murderous, including towards Americans, from the Marine barracks bombing in Beirut in 1983 to the 603 American soldiers killed in Iraq, but deeply corrupt. “The leaders of Iran are racketeers, not revolutionaries,” Pompeo said. The Iranian regime responded by designating all U.S. military forces as “terrorists,” threatening to retaliate against U.S. forces in the region, and having its members of parliament dress in IRGC uniforms while chanting “Death to America”. These threats from Iran cannot be taken lightly. As noted above Iran is responsible for killing numerous Americans in the region, and Iran has attacked Americans and American interests well-beyond the Middle East. This is not a matter of ancient history. Over the last year, Iran has been caught repeatedly engaging (or trying to engage) in terrorism in Europe, from assassinating dissidents in the Netherlands, to nearly detonating a large bomb at a dissident gathering in France last June that was attended by former U.S. government officials. Just last month, the U.S. counterterrorism coordinator warned that the European Union and Britain remained at risk from Iranian terrorism.